- Publisher We are obsessed with "barbarians." They are the "not us," who don't speak our language, or "any language," whom we despise, fear, invade and kill; for whom we feel compassion, or admiration, and an intense sexual interest; whose innocence or vigor we aspire to, and who have an extraordinary^influence on the comportment, and even modes of dress, of our civilized metropolitan lives; whom we often outdo in the barbarism we impute to them; and whose suspected resemblance to us haunts our introspections and imaginings. This book looks afresh at how we have confronted the idea of^"barbarism," in ourselves and others, from the conquest of the Americas to the Nazi Holocaust, through the voices of many writers, including Montaigne, Swift and Shaw. 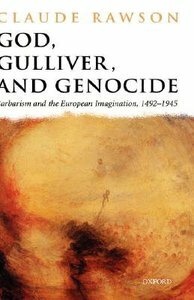 About "God, Gulliver, and Genocide"
We are obsessed with "barbarians." They are the "not us," who don't speak our language, or "any language," whom we despise, fear, invade and kill; for whom we feel compassion, or admiration, and an intense sexual interest; whose innocence or vigor we aspire to, and who have an extraordinary^influence on the comportment, and even modes of dress, of our civilized metropolitan lives; whom we often outdo in the barbarism we impute to them; and whose suspected resemblance to us haunts our introspections and imaginings. This book looks afresh at how we have confronted the idea of^"barbarism," in ourselves and others, from the conquest of the Americas to the Nazi Holocaust, through the voices of many writers, including Montaigne, Swift and Shaw.